I was going to make a video on this when I went to clinic last week, but the hospital I go to are quite strict even with just filming myself in my own room! Obviously I wasn’t going to film outside in the waiting rooms or corridors, but even so I was told I had to get permission first. So I thought I would format the day into a blog post instead. So the reason I have my own room, is because of cross infection with other CFers. The long and short of it is, that I could give another CFer an infection from my lungs and vice versa. You probably know this by now, but we aren’t contagious to the ‘healthy’. If you fancy reading up on cross infection I did a whole long blog post on it here. Once I’m in a room, everyone will come to me. First up is the Respiratory Nurse. They take down my weight, (not so much my height anymore as I’ve stopped growing!☹️) and ask me the usual questions before I do any breathing tests such as, ‘Have you had any surgery recently, or collapsed lung, have you been coughing up blood…’ or just any reason why I can’t do the tests. I’m asked if I’ve taken any inhalers that morning too, so I always make a note of the time when I have them. It seems that hardly anyone has heard of the inhaler ‘Oxis’… I’m not the only one who uses it am I?! There are two numbers they look at. The first, and most important, is the FEV1 (Forced Expiratory Volume). Now this measures how much air I can forcefully exhale during one second. The FVC (Forced Vital Capacity) measures how much air is exhaled overall. It’s not a painful test to do, it’s just uncomfortable. You are literally squeezing all the air out and pushing even after you don’t think there’s any air left to push! I usually get better as I go along, which means doing the maximum of eight tests if I can. I don’t ask what my FEV1 percentage is until after the 3rd or 4th try as I know it takes a while to warm the lungs up. The problem is I already have an expectation of what my lung function should be. So I brace myself for the result. When it’s lower than my target, I feel deflated. But it also gives me determination to try better on the next blow. After finishing the test and the final result is still not what I expect, I feel a bit numb because I know I gave 100% on each test and it still wasn’t good enough (for me). The nurse will tell me that I did well and the numbers are only down a tad. But even so, it doesn’t make me feel any better! Sometimes they are okay, but it always feels like I’m holding my breath till I find out the results. Next the physio will come in. Here we will discuss how my chest has been feeling, if there has been any tightness, wheeziness or breathlessness recently. We will talk about what physio I usually do and if there’s anyway to improve. They will ask what nebulisers I use and how often. I also get asked about my cough. Have I been coughing anymore than usual, any blood? And then of course the grim side is when they ask how much crap I cough up a day AND what colour it usually is 😳. Now don’t get me wrong, I used to get embarrassed by this question but over the years it becomes the norm. I do think it was a shock to the boyfriend when he first came along to clinic… Sorry Tom, should’ve warned you! What’s more is the physio LOVES to get a sputum sample, because they are much more reliable at seeing what infections the lungs are growing than a simple cough swab (a long cotton bud that they stick down your throat which you have to cough on). Even now I can’t cough up stuff in front of people, whether that’s the physio or Tom! I just feel very self-conscious about it! So next up is the Dietician. Sometimes I will see them but not every time. First thing they do is check my weight, which the Respiratory nurse wrote down. Either I’ll get the approving nod, or the disapproving tut! Weight gain is what the dietician relishes in. I swear she would’ve been ecstatic at my weight over Christmas! Mince Pies and Baileys all the way!! Anyway, if my weight has dropped we will discuss what might have caused it, and I get the ‘as long as you don’t lose anymore’ talk. I think I’ve mentioned before, but as a CFer I don’t find weight gain hard. Many others struggle with piling on the pounds, which usually means they eat way above the recommended calorie intake. I’m extremely fortunate at the moment to put on weight and keep it fairly steady. Some CFers struggle to the point where feeding tubes are necessary. We then have a chat over what I would eat and drink on a typical day going through how many Creon (pancreatic enzymes) I would take with each consumption. We discuss my reactive hypoglycaemia and if I’m managing to keep it under control (if you’re unsure how that works, read this blog post here!). Another compulsory topic we talk about is bowel movement, again I’m sorry Tom, should’ve definitely warned you about that one 🙈!!! Because CF affects the digestive system too, that can mean ‘tummy problems’. The Dietician is usually quite open with her questions, but I’ve gotten used to that now, no matter how embarrassing! Other things like sinus issues or achy joints are mentioned here too. Basically any queries I have are brought up and any prescriptions for new medication is sent to the pharmacy. 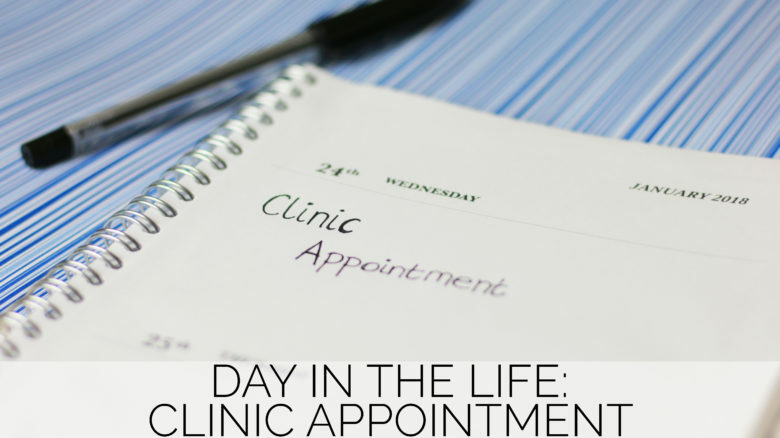 Sometimes they wonder out loud when my next appointment should be or how often my appointments occur… I like to chime in “in three months?” Which the majority of the time is met with a nod. I have tried “maybe four months?” but that was pushing too far! Sometimes, if I’m unwell, I will be back after four weeks. It just depends. After the Doc has gone I’m either free to escape or I wait for a nurse to do a blood test. Joy! Before leaving I’ll pop up to the pharmacy to collect the medication. “12:13 and we’re waiting to see the Doctor. Dad’s talking to himself whilst looking through an electrical catalogue… “Adapters…one or two? … Two? …Two…” Tap, tap, tap on the iPad he goes… “Cor I could fall asleep in a minute…I might get another Latte from the machine…30p…Latte!” He mutters a lot, bless him. He yawns and then looks back down at the open catalogue. “NSBT…they are…no idea it doesn’t tell me…ah £6.40…NHXB that’s what I want…a bit of cable… 5 metres…” Tap tap tap. 12:18, I’ve had to eat a Kit Kat to stop my belly from rumbling. Can’t believe I haven’t put on weight! I mean I had a Costa yesterday, a Starbucks on Friday not to mention all the Rolo yoghurts, cookies and half a pack of Brie in between!